Several years ago, I read Daniel Pink's book Drive: The Surprising Truth About What Motivates Us. His three key elements of autonomy, mastery, and meaning resonated with me and my experiences as an educator. It clearly made an impact considering I can still identify all three without having to look them up. When I saw he had a new book for 2018, I added it to my list. Although a fairly quick and easy read, When didn't pack the same punch for me. 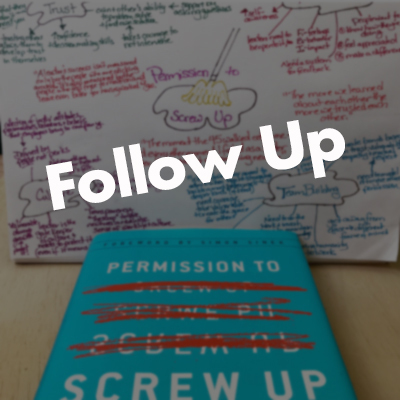 The content overlapped with recent books I've read about timing and the importance of taking breaks such as Power of Moments and Thrive so not much felt new. 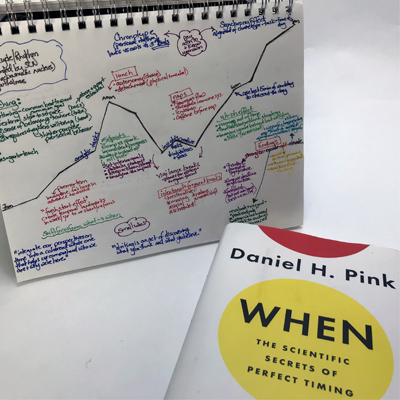 For those looking for practical application, Pink does include a "Time Hacker's Handbook" at the end of each chapter giving ideas for how to implement the information. More effective time management clearly concerns many people as evidenced by the number of books, workshops, and keynotes centered on this topic. Pink takes a unique angle by shifting the focus from what we do to when we do it. Although a good question to pose and reflect on, I still think Simon Sinek's advice to Start with Why overrides the question of when. 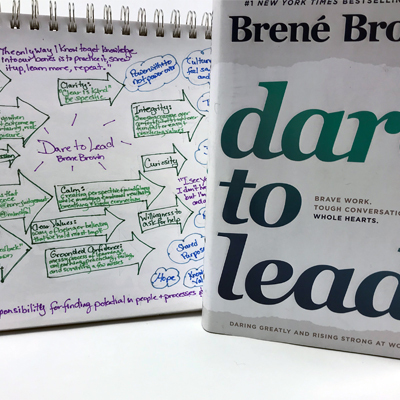 In my experience, when I'm clear on why I'm doing something and how the task at hand aligns with that, I bring more energy to it and it gets done more efficiently. Not to mention, I often enjoy it more, too. That said, the book provided some interesting research and examples from NCAA basketball to the dabbawalas of Mumbai. It also prompted me to reflect more on a few related ideas. Alignment: How often do you find yourself saying, "I need to be doing..." or "I should be working on..." but you have trouble getting started or just find yourself hitting a wall? Pink claims that an alignment of chronotype (i.e. night owl vs lark), the type of task (i.e. analytic vs. creative), and the time of day will yield the best work. 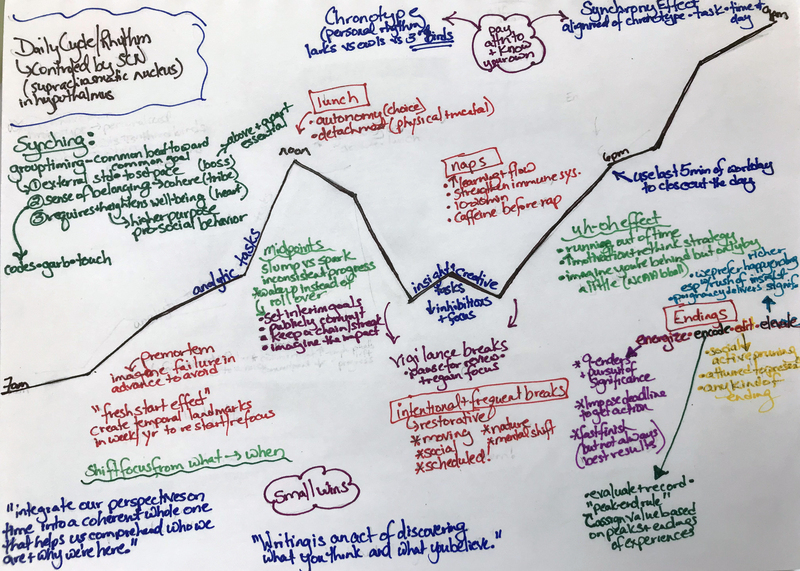 He provides a variety of visuals depicting research that charts our peaks and troughs throughout the day - one of which I used for the background of my notes on the book. As a business owner having more control over my day than many, I have tested a variety of methods to improve my productivity and quality of work throughout the day and week. Some practices work for a time, but then variables change and the alignment falls apart. As an item stays on my to-do list for more days than I'd like, I find myself falling back into the "I should be doing..." mindset and wasting energy fretting about what's not getting done. Although the charts Pink included didn't seem apply to my own daily cycle, I like the scientific approach inherent in it. If we take the emotion and the guilt out of how we approach our work and day, I think we'd have more energy to put into the actual tasks at hand. 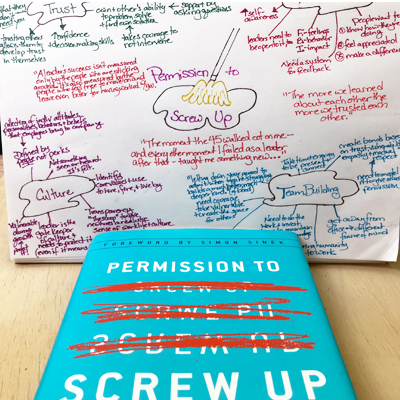 If instead of "I just can't seem to write anything good - I stink," we observed, "I have a hard time getting my creative juices flowing in the morning" then we could adjust the schedule and save a lot of self-criticism in the process. And in situations when the schedule can't be adjusted, developing tactics like "vigilance meetings" can help prevent errors. Really, it comes down to being more mindful, but Pink surprisingly doesn't mention mindfulness. Pessimism/Optimism: As I've written in many blog posts, mindset impacts outcomes. I couldn't help but notice that Pink's terminology and suggestions seemed to have a negative almost pessimistic language. For example, he talks about doing a "pre-mortem" ahead of a project to imagine all possible failures in advance in order to prevent them. On the flip side, top performers like swimmer Michael Phelps use visualization to mentally rehearse the perfect race. Is it better to focus energy on things going perfectly or imagining failure? Is there a place for both of these strategies? He also cites examples like the "uh oh effect" that suggest humans need the threat of a deadline to motivate us, but also acknowledges that it doesn't always result in the best work. Sure, I've produced work only when faced with a deadline, but am concerned about the well-being of people operating under constant threat imposed because it's thought to be the only thing that motivates. Are there more positive ways to build in accountability and helping people to stay on track? I recently learned about the daily huddle that many tech teams and other organizations use. One version of it has everyone stand in a circle and identify three things: a piece of good news, what they're working on that day, and where they are stuck/need help. It's a quick, face to face connection that it starts the day on a positive note and gives daily opportunities to stay on track or get help when needed. I know I do more effective work and feel better in that kind of positive, supportive atmosphere. Writing: My favorite line in the book comes in his conclusion and relates more to the author's experience not the content of the book - "Writing is an act of discovering what you think and what you believe." Writing definitely provides me with an avenue for exploring my own ideas, reflecting on the ideas of others, and synthesizing it all together. Whether free writing in a journal by hand or typing new blog posts, I find writing helps me to go deeper into ideas. I originally started doing these library posts about what I'm reading to help digest the content for people that might not have the time to read as much as they'd like, but I've found they have been invaluable to my getting a better handle on the information. Of course, writing takes time and the question of "when" can become challenging. Some writers get up and write first thing in the morning and sometimes that works for me (like right now), but other days I may only have an afternoon time slot. I also find that other "essential" tasks can push writing to the next day and the next. When that happens though, I get cranky. Seriously, it took me awhile to see the connection, but now I know that I have to make and protect time for this type of reflection. In one of his Time Hacker sections, Pink refers to Ernest Hemmingway's practice of stopping his writing sessions mid-sentence so it's easy to get back into it after a break. I don't do that, but I do like to identify the topic or main idea to explore beforehand so it can percolate and excitement can build. When do you do your best work? Is it different for creative vs. analytic tasks? Does it change from day to day or over weeks? How does your mindset shift throughout the day? Do you find you start to dread tasks that you once were excited about? If so, when does that happen? How can you adjust your own schedule and/or create flexibility for those you lead to adapt to energy level at different points during the day? What practices help you to be reflective? When do you make time for them and how do you protect that time?